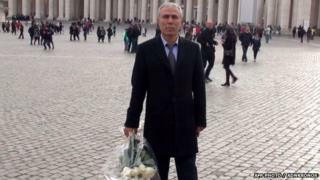 The Turkish man who shot and injured former Pope John Paul II in 1981 has laid flowers on the late pontiff's tomb in the Vatican. Mehmet Ali Agca told police he felt he needed to make the gesture, Italian media report. It comes 31 years to the day that the Pope visited Agca in prison and forgave him for the attempt on his life. Agca served 19 years in an Italian jail for shooting the Pope twice at close range. His motive remains a mystery. He spent another 10 years in prison in Turkey on charges related to the earlier murder of a newspaper editor. Agca, 56, laid white roses at the tomb of the late Pope on Saturday, in his first visit to the Vatican since his attack on John Paul II on 13 May 1981. The Pope was left seriously injured, with one bullet passing through his abdomen and another narrowly missing his heart. Vatican officials have for a second time denied Agca's request for a face-to-face meeting with Pope Francis. "He has put flowers on the tomb of John Paul II. I think that is enough," Vatican spokesman Federico Lombardi told La Repubblica newspaper.